Chevy's OnStar system has told a Santa Barbara, California man that he can't have his own data. Following a major collision that totaled his car, the car owner -- and OnStar customer -- contacted OnStar to obtain the accident data. Instead of cooperating with its own customer, OnStar -- while admitting it had data on the accident -- essentially told Perdue to take a hike and come back with a court subpoena. Perdue owned the vehicle, paid for it and everything in -- it including his data. But OnStar refused to give Perdue his own data even after he sent a request in writing. ONSTAR: GET LOST! ALL YOUR DATA ARE BELONG TO US! The situation began April 16, 2013 when a distracted California Highway Patrolman drove his Crown Vic cruiser at an estimated 40 miles per hour into the rear of Perdue's Chevy Sonic while it was stopped at a traffic light in Goleta. The Sonic was totaled. Despite a major collision between the subcompact Sonic and the massive Crown Vic, neither Perdue nor his passenger were injured. But the Sonic gave up its mechanical life: its frame was bent and the crumple zones well crumpled. Perdue said he was grateful when the OnStar emergency operator contacted him seconds after the collision. While no airbags deployed, the Sonic has accelerometers and other instrumentation that are monitored and both sent to OnStar and stored in the car's Event Data recorder. DATA KIDNAPPING EXTENDS TO "BLACK BOX"
The data kidnapping extends to the even more detailed data stored in Event Data Recorders (EDR) -- the black boxes similar to those required for commercial aircraft that come with most new vehicles. General Motors began rolling out EDRs in the 1990s. This .pdf shows shows widespread the adoption has become across most car companies. Perdue asked for his data by phone and in writing. OnStar said no. The data is Perdue's. 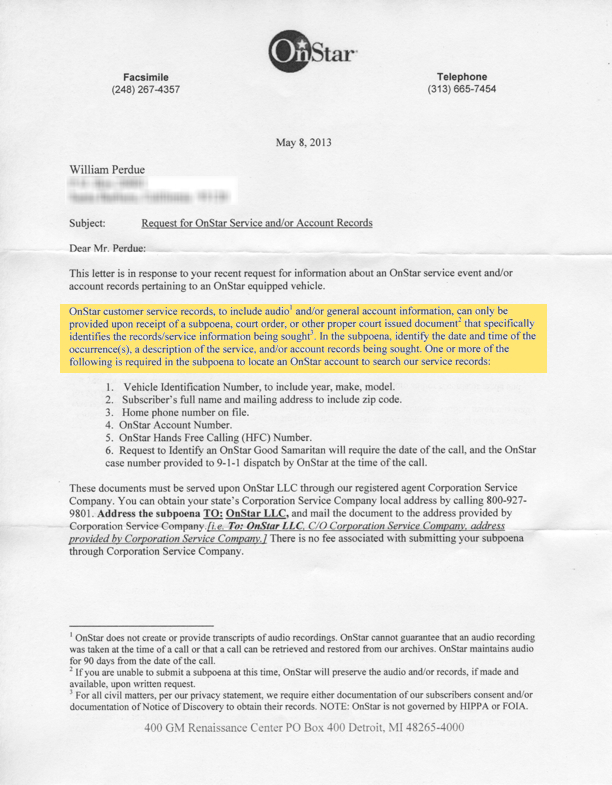 OnStar has illegally refused to return his property. Chevy's OnStar system has grown notorious for reserving the right to use customer data in all manner of promiscuous ways, passing it along to others and using it in ways their customers never imagined. Their Terms of Service have been assailed by privacy activists. OnStar was even forced to cancel a plan to sell the information to outside companies after a public outcry. OnStar's previous privacy violations prompted a senatorial call for FTC hearings. This example is a brazen attempt by a corporate giant to steal a customer's own data for its own use. Interstate theft of data from millions of Americans should be investigated by the Justice Department. WHY IS THE DATA STILL IMPORTANT? The CHP admitted all responsibility. Allstate totaled out Perdue's Sonic. He has a new car. So why is the data still significant? First of all, it's his data that's illegally still being held hostage. Other people in his position may find things did not go as well, and need to obtain the data. Only to find that OnStar's data-nappers refuse to release what belongs to them. Second, event though Perdue and his passenger were given a clean bill of health at a hospital following the accident, the OnStar and EDR data would record G forces and other factors that might be relevant in any subsequent medical issues that might develop. Third, the G forces and other data captured by the Sonic's EDR sensors could be compared to crash data collected by NHSTA and private accident reconstruction companies to better determine the level of damage done to the frame and other elements of the vehicle. That data could contribute to the overall understanding of the crashworthiness of vehicles which have been repaired after major collisions. Insurance companies and repair shops have a financial incentive to repair cars even those that can never be as safe as they were before a collision. If your only damage estimate comes from the repair shop tied to your insurance company, you're in line to be screwed. Because the repair shop has a financial incentive to push their estimate to the maximum allowable withOUT totaling the vehicle -- even if the vehicle should be totalled out. Because, if the repair shop totals it out, then they lose the money from the repair job. The insurance company also has a financial incentive to avoid totaling the car out -- even when it's proper for safety -- because that costs them more money. The repair shop knows this, so they're careful not to total out too many cars because that means they could lose their favored status with the insurance company and, by doing so, lose the easy money. This practice shafts the consumer. Because repairs from a major accident where the car should be totaled means that a consumer can be stuck with a lemon and a safety hazard. And the financial disaster that comes when a CarFax reveals that no one will buy their car because the genuine retail value of their car is ZERO! If you feel your vehicle should be totaled, the second repair estimator should understand that.